Bonnie Langford joined Doctor Who in 1986, when the show was not entirely loved by the BBC. "I knew there were problems," she says. "Michael Grade had taken over as Controller of BBC One and was not a fan of the show. He felt it had had its time – and I don't think he was 100 per cent wrong. Technology was moving fast and overtook what the budget could afford. Doctor Who needed a big revamp." 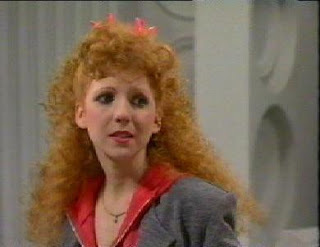 Bonnie played Melanie Bush, a plucky computer programmer from Sussex – though we only saw her there in publicity pictures. We met her aboard the TARDIS, already established as the Doctor's companion. Generally, a companion's first story tells us who they are, where they're from and what motivates them – so did Mel's character suffer for not having that? "Probably," says Bonnie. "I didn't know any better. I was given a script and went, 'All right – that sounds fun.' No, before the script I had a paragraph of three or four lines. Mel liked drinking carrot juice – which I don't like – and exercising, and had a fun relationship with the Doctor. And she was a computer programmer from Pease Pottage. That was it: that was my character." "A few years ago," she continues, "I did a convention with one of the other companions, who said, 'The thing about the companions is they're pretty much two-dimensional'. I was quite pleased having thought it was just me! I did find it frustrating at the time. I didn't feel I had a lot to contribute. My main role was to get in the way and be bouncy." Bonnie came to Doctor Who with a wealth of experience. Aged six, she won the talent TV show Opportunity Knocks, which led to her playing Baby June in the West End and Broadway revivals of Gypsy, an appearance in the Alan Parker all-kids film Bugsy Malone, and a starring role (as Violet Elizabeth Bott) in the children's series Just William. Was Doctor Who more demanding or pressured than what had come before? "It was just weirder!" she laughs. "I didn't realise it came with all this baggage. I saw the scripts and thought, 'OK, I play this character.' But there was much more to it than that. You were now part of a community." 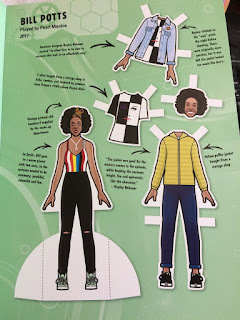 "The first things I ever did connected to Doctor Who were two conventions in America. I hadn't even played the part, I'd seen no more than that three-line paragraph, but I was asked deep and meaningful questions about Mel. So I did an awful lot of bluffing – and found that hilariously funny. The other companions and Doctors there took it unbelievably seriously, which also made me crack up. I don't think I've ever laughed so much in my life. Oh dear, I was completely and utterly disapproved of straight away." "The fans," she adds, "were delightful, though they all tried to tell me how to be a computer programmer. I should have told them not to bother: I never went anywhere near a computer in the show. That seems ridiculous now, where we're all surgically attached to our computers." What would Bonnie have done differently with Mel, given the chance? "Cheery is fine, but there could have been times when her expertise came in. She could have done more technological stuff, been more proactive and had her wits about her, rather than just being cajoling and jokey. I've been able to expand on her a little in the Doctor Who audio adventures from Big Finish that I've done." Bonnie's first scenes as Mel were filmed at a pottery museum in Stoke-on-Trent. "It was a strange introduction to the show. 'I said I couldn't bear fire, so of course the first thing I had to do was open a door onto fire. I was thinking, 'Oh great, thanks!' It was night filming and freezing cold – I soon realised that was the job I'd signed up for." "But it was quite jolly. Colin [Baker, the Sixth Doctor] was friendly with Geoffrey Hughes, who played Mr Popplewick, and we had a nice old social time. And I went to the gym quite a bit. There was a lot of behind-the-scenes angst going on but I was glad not to be part of that." Indeed, script editor Eric Saward left the series after an argument with the producer, John Nathan-Turner. And he wasn't the only one to be leaving; Colin Baker was told that his contract would not be renewed. "I wasn't really told what was happening," says Bonnie. "I remember John asking what I thought of [Seventh Doctor] Sylvester McCoy. Not long before that, I'd been in Pirates of Penzance with Sylvester, who was adorable. But I said to John, 'Please don't let me dance with him because he stands on my toes.' Sylvester was light-hearted and jolly. He was the perfect person to come in because it had been quite intense and I know that Colin wasn't happy at the end." How much does the leading man define the feel of the show as you're making it? "A lot. But then it's difficult to say because Colin was already established in the part when I joined. I remember lots of discussion about the characters and the way the show should be, which I didn't feel I was party to because I was the newbie." "Colin was definitely in charge whereas Sylvester was more gentle in his approach at first – because he was the new guy. And Sylvester was more knockabout than Colin. Colin used to be a lawyer and was cerebral, while Sylvester was always trying to get pratfalls and playing his spoons into the show." "But the only thing that was hugely different was on a physical level – Colin was much taller than me so I had to clatter about in these three-inch heels, running down corridors, so we'd fit into a two-shot. Sylvester is slightly more my height so I could wear trainers." Bonnie left the show at the end of Sylvester's first season. "I signed for two years. John said, 'Oh, but you could stay.' I said, 'But you never asked me – and I've got another job.' I felt I'd done my time and there wasn't anything that made me think, 'Woah, yeah, I'm gonna stick with this.'" "It was fun making Doctor Who; they were all lovely and I had a good time. But I was quite happy to move on to something new."